Alex Honnold is a climber, but not the ordinary kind: He free solo climbs extremely high, very dangerous big walls. Free soloing is a form of climbing that entails scaling a surface alone and without the assistance of any protective equipment. There is essentially no margin of error in free solo ascents; any mistake can prove to be fatal. 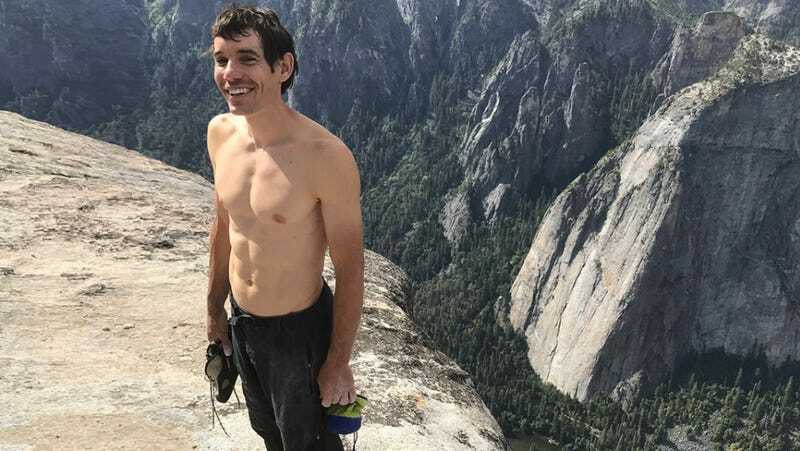 Many professional climbers have fallen to their deaths while soloing, and while that might prevent some people from continuing the practice, it barely fazes Honnold. He intimately understands the risks, but forges forward anyway, partially because soloing makes life feel more immediate. It’s the thrill of the climb that keeps him alive. Unfortunately, Free Solo suffers when Vasarhelyi and Chin psychologize Honnold or attempt to explain his drive for death-defying climbs. 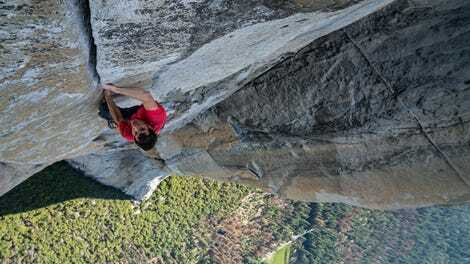 It’s understandable why the filmmakers would want to examine Honnold’s psyche, given that his Spock-like demeanor and curiously casual approach to soloing does raise certain questions about his mental stability or lack thereof. Yet every “answer” they ascribe to him (or he ascribes to himself) feels pat and unconvincing. Honnold mentions his father, who was emotionally unavailable to Honnold’s mother but also spurred his son’s interest in climbing. He describes his “dark soul” as a child and his “bottomless pit of self-loathing.” There’s some talk about being a loner in school. Yet none of those explanations are as persuasive as an MRI diagnosis that simply concludes he requires more stimulus than most people. Similarly, Free Solo’s fixation on how soloing affects Honnold’s relationship with his girlfriend feels transported from a more banal film altogether. At best, this material is uninteresting filler, and at worst, it’s a distraction. While the psychological analysis fails to captivate, Free Solo gets interesting when actively interrogating the ethics of filming Honnold on his climbs. Vasarhelyi and Chin correctly identify the queasy voyeurism of filming such stunts, given that their subject could fall to his death at any moment. Their concerns only increase when Honnold voices trepidation at being filmed on El Capitan at all after an anxious practice run. (His awareness of being filmed affects his confidence on the climb.) As a result, Honnold’s solo climb up El Capitan, a disappointingly brief section of the film, is understandably circumscribed to ensure his safety. Chin and Vasarhelyi keep cutting away from Honnold to the cameramen on the ground, who provide nervous spectator commentary, constantly reiterating the danger that Honnold faces every time he surpasses a new pitch. It’s a needless effort to explicate the stakes, but one that makes sense considering that a more in-your-face method might fatally disturb Honnold. It’s easy to imagine an exposition-free, process-focused version of Free Solo that exclusively follows the El Capitan climb, which would enthrall entirely on the basis of Honnold’s physical prowess. As it stands, however, Free Solo still has plenty to offer in the edge-of-your-seat department.